Adam Curtis, Britain's premier documentarian, recently began to espouse his theory of "Static Culture" particularly in relation to music. His thought process goes that musicians no longer strive to create anything new and, instead, pilfer ideas that have already been used and worn out, repeatedly ad nauseum. As such, modern music exists primarily in a zombie-like fugue - boundaries are adhered to rather than pushed and the path less-trodden remains so. As a documentarian, it is apt that Curtis' theory can easily be applied to the field of non-fiction cinema which has found itself, in recent years, stuck in a period characterised by an unparalleled paucity of creativity. Most directors have begun to make "template cinema" - in which the names of their subject are copied and pasted into a very rigid framework and, as such, deprive their films of energy, originality or passion. For them, an "interesting" subject is all that's necessary to create a movie - their ideas of what a documentary has to be, of cookie cutter art, will fulfill the rest of the task for them. This is true of the film Hockney - a documentary as lacking in creativity as its title. Its a documentary about Hockney, called Hockney, but (for all intents and purposes) could be about anyone. 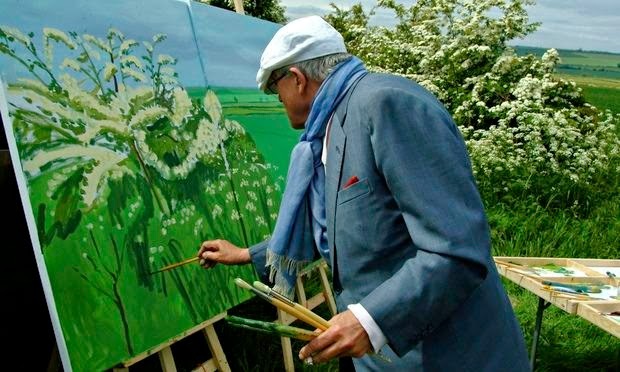 A prime example of the new trend towards ultra-conservative cinema - of moving pictures which can never be moving - Hockney, tells us little about the artist (in either the tone of the presentation or the content therein) which we could not experience via ten minutes on Wikipedia. Facts of Hockney's life are laid out but with the structure, and emotional vivacity, of a bullet-pointed presentation. This is the cinema of the middle-brow, of the worthy - created for an audience who don't like movies, who don't care for the expansive power of the medium, but instead want to show their peers how cultured they are without having to actually engage with art. The only culture they, and this film, are truly espousing is "Static Culture" - for those who truly love art, cinema like this should be avoided at all costs.